This TAS improves the previous run by nearly two hours!!! I managed to significantly improve this part of the game. Turns out you just had to press A at the right time, who knew? I skip 1-1 for now by abusing a warp from the intro; this allows me to Baxter an item that significantly speeds up 1-1 later. Thanks to the item I brought from 1-2, I was able to abuse a new glitch that lets me turn any enemy into a coin. Needless to say, it makes the level quite easier. For some odd reason, the previous TAS did not use the platforms to gain boosts in this level. How odd. Thanks to some black magic, I flooded the castle and sunk it underwater. This allowed me to jump over it to the goal while collecting the flowers and coins that floated to the surface on the way. However, a side effect of this is that the bonus game becomes unavoidable, so please excuse that. These levels were done with the help of masterjun, who requested that they be put on TASVideos Pro only. Please direct all questions to him. I use a new glitch to collect all five flowers before even entering the level. Also, I didn't want to fight Bowser because of how hard he is, so I just redesigned him as my own OC, who is significantly easier to fight. 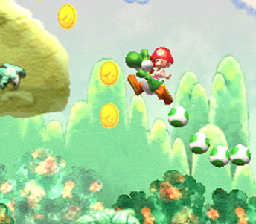 Mothrayas: For a run of Yoshi's Island, there's an awful lack of Mario riding a Yoshi, baby or not. Rejecting.